If you have a nearly 13 year old boy on your Christmas shopping list, have I found an inexpensive gift item for you! It’s cheap, it’s fun and slightly dangerous, what more could a nearly 13 year old boy want! Dry ice?? Yep, dry ice. I wouldn’t have thunk it myself but let me attest to how wonderful you will be in the eyes of an almost 13 year old OS if you get him a chunk of dry ice. I think if Ike could prepare curriculum for 7th grade boys, it would involve only two classes – P.E. and Dry Ice. The end. Class dismissed. It all started when the Hubs, Ike and I went to work out and on the way home, we went to buy some lettuce. Excitedly, Ike begged and pleaded the Hubs and I to also purchase a bag of dry ice. Oh, if you could have seen the look of utter joy as the dry ice went down the conveyor belt and our bag boy slipped the chunk it into the plastic grocery bag! I don’t know if I’ve ever seen the child this happy even about ice cream! We arrived home and Ike was eager to experiment. After placing the slab in a bowl, he went to work. In school, he learned that if you place a nickel on dry ice, it wiggles. The Hubs and Ike used a quarter and shazam, observed similar results. Then Ike marveled at the billows of cloud-like smoke swirling just above the bowl after putting water in the bowl. Another experiment involving dry ice and soap created foamy, dramatic bubbles. He loved it so much, I think if Lebron James himself would have sauntered into the kitchen, Ike would have merely given him a passing nod, maybe a little, “Wuz up” which is saying something because Ike has already determined he WILL have a child named Lebron one day! This past summer, Ike had a lot of fun making a brain but it smelled funny and what do you do with a mushy brain when you’re finished with it? As long as you don’t put your hand on it for long, I have learned the dry ice is pretty cool with no unpleasant odors. Every thing about the dry ice produced a “Mom, come look at this!” moment! I will admit it was interesting. The only thing that was rather annoying was when we sat down to dinner. The dry ice had been placed on the table. We were bowing heads, holding hands and as we began to pray; gurgling sounds came rising from the bowl. The bubbling was so loud, it nearly went above the petitions we were making to the Lord! You know how your stomach sounds if you are having diarrhea-like symptoms or if you’ve had food poisoning? Well, those are the sounds of dry ice if you put a lot of water on it. Ultimately, it became so gross and disruptive, we had to banish the dry ice outside until we were finished praying and had had dinner! For three hours, our almost teenager, played with dry ice. That had to be the best $5 I have ever spent on a child. 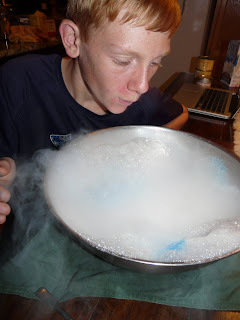 Based on how much fun he had and apparently how much he learned about dry ice in class, I think we will be getting some again in the very near future! It was fun seeing our boy wildly loving something as simple and cheap as dry ice. If you have been reading any of my recant posts, then you know “we” are having a lot of wild moments lately (if I could only blog about more of them!). A perfectly content, pre–adolescent boy is a thing of great beauty these days. ← Oh what a beautiful day! What a cool gift! I NEVER would have thought of that. You must be the coolest woman ever in the whole wide world EVER to buy that. I’m definitely getting some for my 13 year old for Christmas. Thanks for the tip!